2 Bedroom End of Terrace House To Rent in Egham for £1,195 per Calendar Month. A charming end of terrace Victorian cottage with a generous garden, located moments from the heart of Egham. 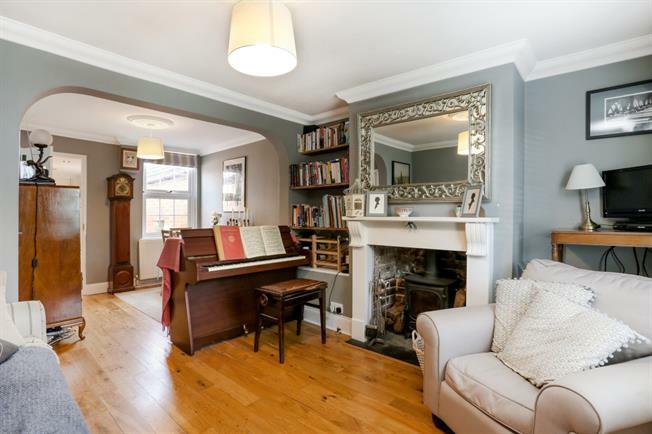 This delightful property retains many original features, with additions such as wood burner in the living room and tastefully extended kitchen, and has a general focus on comfort, character and warmth. Situated on a cul-de-sac walking distance from the town centre and all it has to offer, including rail link to London Waterloo, excellent road communications, as well as an abundance of shopping facilities, bars and restaurants. Historic Egham has a variety of shops, cafes and restaurants and a mainline station to Waterloo with regular train services. Runnymede, the well recorded site of the signing of the Magna Carta, is nearby and provides rural walks and access to the River Thames. Egham has excellent road communications with access to the M25 motorway network approximately 5 minutes away providing fast links to London Heathrow and Gatwick Airport to the south east. Sporting and leisure facilities in the area are varied with horse racing at both Windsor and Ascot, polo and horse riding in Windsor Great Park, golf at Sunningdale and Wentworth and rowing and boating on some stretches of the River Thames. Englefield Green is also within easy reach of renowned private and international schools.